Right when the DVD first came out, Matt and I watched tons and tons of Lord Of The Rings commentary. One of the segments was about digital grading and how they made the scenery just POP out of the screen. So now, whenever we see bright green grass, we joke that it’s been digitally graded. Well this week, our entire yard has gotten a digital boost. Everything is neon green! For more info on our yard, check out Matt’s latest post on our garden: The Garden of 2009. I came down at 8 to make breakfast and had yogurt on the brain. But I was SO COLD! The thought of eating yogurt was torturous, so I just turned my base into hot oats. It ended up being an awesome bowl! Exciting news: Meghann, Tina, Heather, Caitlin, Jenna and I are in the early stages of planning a Blog Summit!! We’re hoping this will be a chance for all of us to get together in one room with a bunch of fellow bloggers and readers from all over and have a blast talking about all the fun things we discuss daily via keyboard. We’re envisioning a weekend late this summer (TD) in a cool city (TBD), and we already have a few sponsors up our sleeves to make it happen! I hope I’ll be able to meet many of you guys there!! Awesome breakfast! And, thanks for the discount code on Yoga Download- I’ve been wanting to give it a try! The Blog Summit sounds really cool too! Can’t wait to hear more! Spring rocks! Aside from thunderstorms. A blog summit sounds like a blast! Good luck with the planning. Wow, that is really fun news! I hope it all comes together (and that I can attend!)! I have issues with my right wrist as well and yoga, push-ups, things like that seem to tweak it. Not quite sure how it happened, but it can be really annoying when trying to do some of the yoga moves. I’ve seen things out there like wrist supports for issues like these…maybe that would help?? it’s amazing how fast the grass turns green! I’ve been loving that about all the rain lately. can’t wait to hear more about the Summit!!! I spy the almond butter 😉 Looks like another amazing bowl of oats from your kitchen! What a fun idea about the bloggers summit! Can’t wait to hear more! I have never tried Zhena teas I’ve been searching for the coconut chia and can’t find it anywhere! A blog summit sounds like so much fun!! I am beyond excited about the summit! If I can be of any help let me know! Also the oatmeal combo looks awesome today, lots of protein! Gorgeous yard. Off to read Matt’s post. You have such a big garden! Hope the blogger summit will happen! As a yoga teacher for many years, I see a lot of students with wrist issues, generally caused by improper hand form in down dog and chattarunga. If you’re new to yoga I definitely recommend some led classes for this reason! Next time you’re in down dog, notice your hands. You should be putting as much pressure in your fingertips and your tHUMB as there is in the ball of your hand, by the wrist. Spread the fingers wide, and root down through all 4 corners of the hand. Sometimes the thumb likes to peel up and we hang out in the wrist too much. Also make sure you aren’t taking too short of a down dog. We sometimes feel that it’s most important to get the heels to the mat…not so. You should be able to go from DD to plank WITHOUT moving the location of your feet! Check it out! The point is to create more SPACE with the body and through the spine! If you like, take a pic of yourself and I can comment! ;0) I’ts a VERY common thing with a lot of students and unfortunately a video or download can’t adjust you! Give it a rest of a couple weeks! Great idea about the blog summit. Let me know if there is anything I can do. I loved Matt’s Garden review… I even linked back to it in my last post because I found it so helpful! Make sure to thank him for that .I already commented on his site but just incase! hey kath.. I have similar wrist problems, both from typing and just from life (born that way? not sure…). It helps me to wrap up my wrists when i go to bed at night. also, doing upper body weight exercises in general strengthen my forearms which help with some of those yoga moves that often hurt my wrists and thumb-to-wrist connection (whatever that is called). yay for letting the Kat out! Hope you have a great day! Gorgeous breakfast! I’m so ready for the blog summit. This will be the event of the summer. A blog summit sounds like a great idea! I agree with Nate. Though I think it will be the event of the YEAR. A blogger summit – sounds awesome! i’m hoping for august so i have a chance of going! sounds like SO much fun. The blog summit sounds like a great idea! 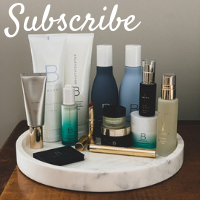 A blogger summit sounds fabulous! Will you be attending BlogHer in Chicago Kath? Or…… if you’re looking for a city that isn’t super hot and humid during the summer, Seattle, WA and Portland, OR have GORGEOUS summer weather. Breakfast looks so good! And I love that you eat outside, it’s so peaceful. Can’t wait for the summit! Check out my blog as I run with Team in Training and raise money for blood cancers! Gorgeous yard! Can’t wait to hear more about the summit!!! I usually read in Reader but wanted to pop over to comment about the wrist-yoga situation. I practice regularly and I have wrist problems too. There are a couple of fixes my teachers have suggested, any of which you might find useful. 1) wrist support gloves – these are kind of like carpal tunnel gloves. i found they were very expensive and my hands slid. 2) using wrist supports, usually wedges, either wood or foam. these are good but my hands often slide on those as well, although putting the small foam ones underneath a yoga towel (between towel and mat) helps with that. 3) try doing the poses on ridgetops or in kickstand – that is, instead of your hand flat on the ground, bring the heel of your palm off the mat so your weight is on the ridge below your fingers (i.e., the palm-side of where your ridge of knuckles is on the top). kickstand is similar but the thumb is farther back like a little kickstand for the ridgetops. 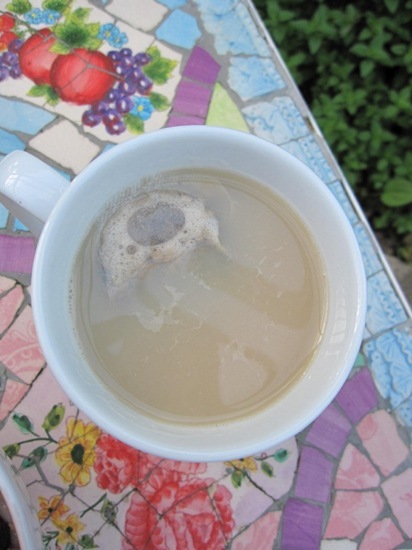 using ridgetops/kickstand does help – as does using what in anusara we call “muscular energy” – hugging the muscles onto the bones (i.e., engaging them), all the way up the arms to help take the pressure off the wrists. good luck! oh, sorry, one more anusara piece of advice – which may or may not be the right form for you depending on what style you are practicing. but in anusara, we plug the shoulder blades into the back so that there’s a solid foundation. this also helps relieve pressure on joints like the wrist, because you are supported by the correct bone structure and alignment and so your muscles have an easier time holding you up, which means less strain on the joints. i would try that too – especially important in poses like downward dog, vashistasana and vashistasana prep, etc.! 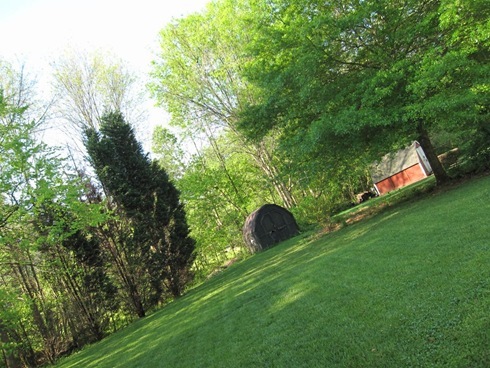 Your yard is gorgeous – and Matt’s done a great job with all of the gardening. It looks huge, though – are you guys on about an acre??? Oh, I love all the green! oh! I am with the reader or voted that the summit be in Portland or Seattle! Both “cool” cities and great for summer. 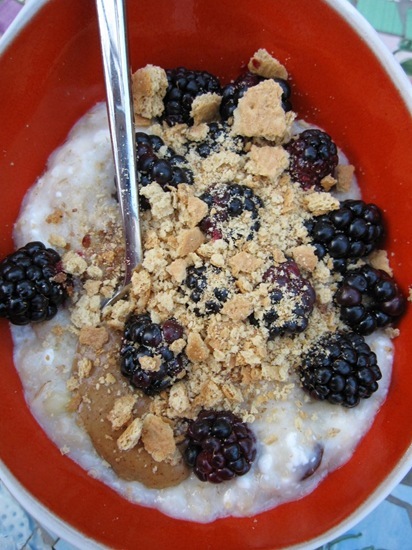 The graham and blackberries look delish! I read about the summit on other blogs and I totally think that would be an awesome event! Hi Kath! I wanna go to the summit! 🙂 What IS a summit? YOGA… try rolling your mat on the end near your hands. Then place the palm of your hands on the rolled part and the fingers on the floor when in down dog. Also, be careful when lowering into chaturanga that you never for farther than you elows in height away from the floor… then it’s just a nice lift up into up dog. Does that make sense? I used to have tons of wrist problems when I first started. Now my students often ask about this… hope that helps!! Love the neon green 🙂 Please have your blogger summit in Chicago! There’s a lot to do in the summer! Alright, that’s the only time I’m going to beg – promise. Oh my goodness the yard is beautiful! That’s the most incredible green I’ve seen in a long time. I cannot wait for more details about this summit– it sounds awesome!! im so jealous of all your yard space. in socal that would be like 5 million dollars worth of land. What abotut Hillsborough, NC, that’s a cool city! (No matter what you thought in high school.) Well, I guess it’s more of a town…. A Blog Summit sounds like so much fun!!! I am totally down for going! Make it in Boston or Southern CA, and it’s a definite yes. 🙂 Ok, make it wherever you want, hehe. But I’d love to join. hey. i know there’s lots o talk about garmin watches. there’s one for the deal of the day on amazon goldbox. it’s only $50. gah. wish i hadn’t just splurged on the polar. What a gorgeous backyard!! I can’t wait until our yard has been digitally graded – we’re getting enough rain that it’ll be green like Emerald City! Definitely can’t wait for more info about the blogger summit what a cool idea! Your breakfast looks amazing! I’m slowly getting more adventurous with the oats, but it’s a slowgoing process. 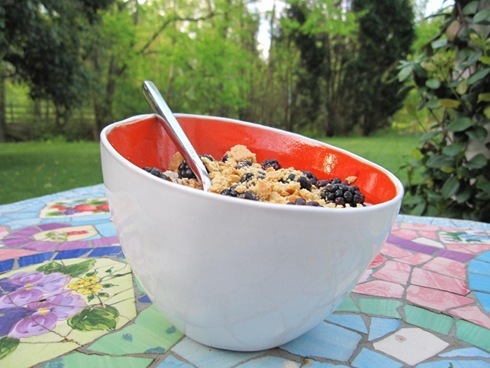 Love your dish, by the way … I have to pick up some cute bowls! Blog Summit is an awesome idea!! I would love to be able to meet all of you. You should meet in San Diego or LA because the weather is awesome out here and it seems like you all are always on the west coast. I saw your hidden spoon of pb peeking through! I was lucky enough to have taken the survey before it crashed…While it would be great to have the summit in NYC or Boston etc, lodging would be extremely expensive for most. I voted for Niagara Falls! Graham in oats. What a fabulous idea. I love the idea of a summit! You can find good lodging deals in NYC if you know where to look. Hit me up with any questions. I am well-known among my friends as the guru of free/cheap for entertainment, traveling, etc. 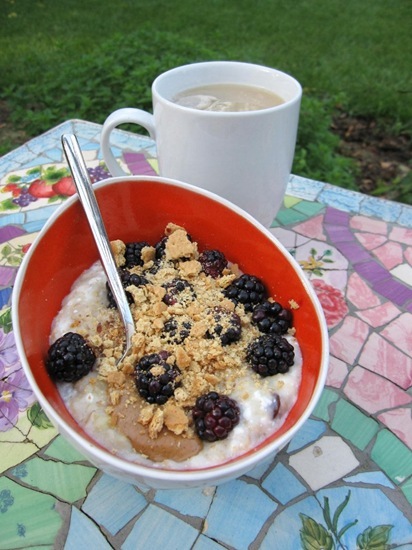 Gorgeous Breakfast Kath… huge fan of the black berries. Blog Summit…. well well now 🙂 Do you have to be a girl? I cant wait until we get blackberries here…yours look so fresh! Either way, can’t wait to hear more about the event. You ladies are really business savvy; I must say I’m impressed! The Blog Summit sounds fun – can’t wait to hear more about it. 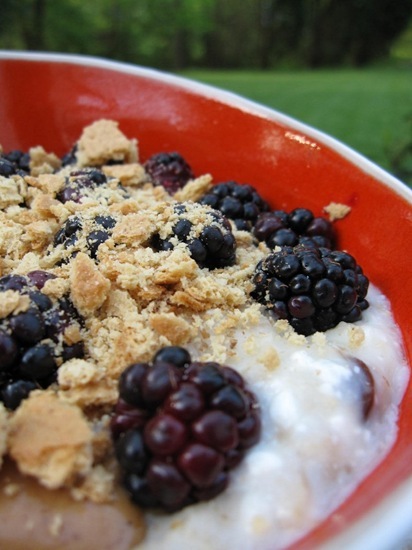 Your oatmeal looks and sounds amazing – like a blackberry cobbler – yum! Asheville, NC! Great food, beautiful scenery, especially during the summer. Kath, I thought of you last night b/c I held Crow pose for 3 seconds for the first time!! I was so excited and I remember your photo of you doing it a few months ago. Kath & anyone willing to comment on this- I loved your Gather article and all of the ones so far mostly because you talk about things I am going through now. I am SO CLOSE to my goal weight but still now, 8 months later, I haven’t reached it. 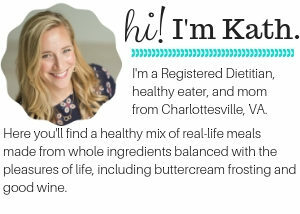 I am starting to log carefully on CK again, planning my meals ahead of time etc. And my net is back down to 1200 BUT… HOW do you manage to get through those late evenings or even those working afternoons where you’ve already eaten your packed lunch and snack and still have hours until dinner. I can’t “afford” any more calories from my calorie budget, and seltzer isn’t cutting it anymore. Tips? splitting lunch in two? more water? have it in new york!!! Love the oats this morning. When you have cottage cheese with your oats, when do you add it in during the cooking process? That would be SO exciting with the blog summit! Chicago is always a good, central location! Good luck with the planning and be sure to keep us all up to day on the info! Your yard is beautiful and looks like such a peaceful place to be! I love the idea of a blog summit! How fun! Our yard is only a third of an acre! It just looks big because we’re at the end of a cul-de-sac, so our front yard is a tiny little corner, but the back widens to a huge swath of grass. The lawn looks great! I read about Matt’s (not-so) garden on his blog. I am sure it will turn out great this year. Love the yard! So spring-like! I know you were in San Francisco before, but it would be a great place to revisit for the Summit. How fun! Thanks for the yoga advice! I think the root of my problem stems from my computer mouse/typing overuse, not the yoga. Strangely, putting the weight into my fingers and thumb properly makes it worse. If I put my weight on the outside of my hand, it’s better. But pressure on it is worsened by yoga. I’ll try some modifications. Oh man – good deal! I’d ask you all the usual questions: are you sure your goal is realistic (you look pretty good to me! ), is your NET too low, are you getting enough exercise, are you eating packages or REAL food? I would say splitting up lunch might help or just try eating an earlier dinner? It’s hard to give advice without knowing all about your lifestyle. I always stir them in at the end. Wait, I thought you were against palm oil consumption? You know the Maranatha Almond Butter has palm oil in it right? I don’t mean to beat a dead horse, I just want you to be aware. I am aware, both of MN’s palm oil inclusion and of its dangers to the environment, but I am not “against palm oil consumption.” This is the ONE product I eat with palm oil in it, so I think my footprint is pretty small. Blog summit sounds like an amazing idea/concept. Can’t wait to hear more about it!!! so jealous of that lawn! and the weather! i’m looking forward to hearing more about the blog summit! I am so excited by the idea of a Summit! Anyway you could swing the location towards the South East? I live in NC too, near Hickory. This weekend Husband and I went to the Earth Fare in Boone because of your high recommendations. WE LOVED IT! Hey Kath! “Fists for wrists” (a YogaFit phrase) is actually a totally acceptable way to approach a lot of poses if you have hand/wrist injuries. (YogaFit is the program I’m doing my yoga teacher training with & actually the same program that Polly did!) We teach it as a modification. If you have a tendency to have pain in your wrists, do the fists for wrists and don’t feel bad about it! You need to find the perfect pose for you 🙂 It’s not the same for everyone. I’m really looking forward to hearing more about this blogger get-together! I will DEFINITELY look into coming! I’m excited about a blogger summit too! Of course having no idea if I could come or not, I’m already excited at the thought of a big group work out! And chatting about these things in person with a bunch of like minded people…. LOVE it! What a fun idea, can’t wait to see what transpires! 🙂 When tossing around ideas of where to have it, maybe pick a city that’s an airport “hub”, to allow people to have the fewest amount of connecting flights? But maybe that will make your blog summit a blog CONFERENCE!! hehehe…. fun fun! hey kath! 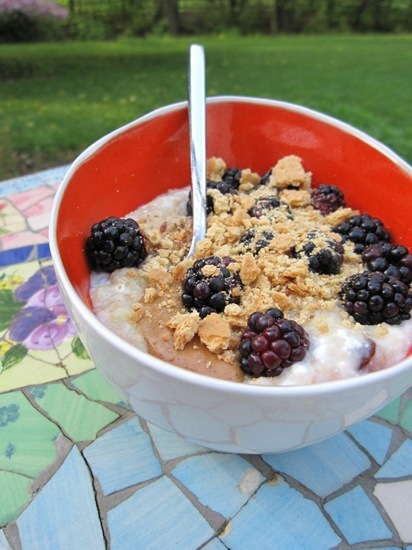 i actually made blackberry oats this morning too! AWESOME combo!! i’m in love w/it! you should try it out! shannon, dont you think thats a little harsh? no ones perfect and kath already gave you here answer. can’t wait to hear where the location will be! Oh!!! I love the idea of a blogger summit. I am with everyone who voted for Chicago. Of course, I DO live in the midwest 😉 I can’t wait to hear more details though!